The modern reverse proxy your cloud needs. Traefik powered up with businesses in mind. Have our team of experts at the ready to secure your production. Our experts will work with you to optimise your Traefik architecture, design, and configuration, while developing your teams' Traefik skills. The 5-minute tour you need to see how you can leverage Traefik to propel your IT! Quickly see how TraefikEE builds on Traefik, bringing distributed features to your business-critical cluster. Want to browse through our official GitHub repositories and enjoy best of the breed code? Engage in conversations with other users. Come and join our Community Support channel on Slack. It's a gopher, but it tweets! Never miss a Traefik event that happens nearby! Our team, our philosophy, our goals ... the fun. Wanna join an incredible team? Browse open positions, or just apply if you think you're a great fit for the company. If you need to talk to us, you can reach us there. We talk, and sometimes we also write. Join our awesome distributed team and be part of the Traefik adventure! We are a group of open source enthusiasts that are passionate about infrastructure. 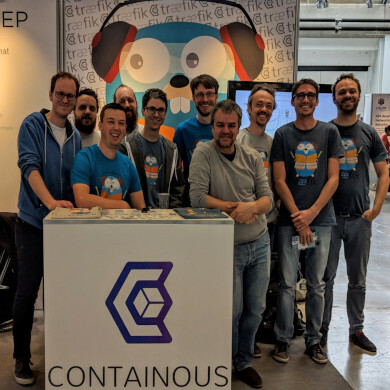 Containous develops advanced software solutions for companies committed to using container technologies. Our first product, Traefik, is an open source cloud native edge router, with over 300 contributors, 600 million downloads on DockerHub, 21000 stars on GitHub, and an active and supportive global Slack channel. We are expanding to the United States and are adding a developer advocate who is fluent in a fast growth, startup ecosystem, to the team. This is a high visibility, technical role which will excite those who love building with smart teams and working on open source software. If you’re qualified, passionate about container technologies, and excited about joining a global team, you should apply. Comfortable coding and hacking on Docker and Kubernetes in an enterprise environment. Experience with Rancher, Mesos, and other technologies that Traefik integrates with. Possess an existing relationship with and have a deep love of open source software, proven by existing contributions on GitHub. Accomplished public speaker willing to speak at conferences, Meetups, and other relevant engagements. Already an active author on technical topics, and have a referenceable social media persona. You are excited by the responsibility of writing to a reasonably cadenced editorial calendar, and by the idea of collaborating on the creation of other educational technical content such as demos and videos. A love of travel and spending time with the communities and ecosystems around container technologies. Envigorated by teaching teams how to get the most value from using Traefik and other Containous products. Bring your creative ideas to the table to help create an undeniably awesome developer experience. You possess a love for engaging with a diverse set of people from all walks of life, and are proactive about creating inclusive communities. You’re skilled at working autonomously, yet highly collaborative and are comfortable in a remote work culture using the tools associated with such a culture. This position is based in San Francisco, California, though we’d love to speak with any qualified U.S. based candidates. Our other offices are in Paris and Lyon, France. We offer fair, competitive, and transparent pay and comes with a comprehensive benefits package. Data Centers around the world are experiencing a massive ®evolution, driven by containers, microservices and cloud native architectures. At Containous, we develop advanced software solutions for the modern data centers. Our first product, Traefik, is being adopted at an exceptional rate: more than 21000 stars on Github, 600 million downloads on DockerHub, in production in thousands of data centers: it has become a recognized market leader less than 2 years after launch. Having largely proven product-market fit, Containous is now building the Marketing and Sales team that will drive it to the next level, with solid business ambitions in Europe and the USA. If you love the energy of fast growing tech startups and feel at home in the data center infrastructures space, Traefik may be your next challenge! You are the voice of our customers: You understand their goals and their needs, how our products impact their processes, you guide them on improving their experience with our product. You interact with them on a regular basis via various means and engage both reactively and proactively. You provide our clients with an optimal onboarding experience, train them to become increasingly self-sufficient, and accompany them as their usage grows. The success of your mission will transform our best clients into ambassadors; you will also understand their future needs and help identify and close upselling opportunities. Your knowledge of our clients’ usage and needs will contribute to the definition of our product strategy. As such, you will work very closely with the rest of the team (CTO, Sales, Product marketing). Based on your skills and successes, this role may take a managerial dimension as our users base and team grow. Evaluate how industry trends, competitors, and standards relate to Containous’ overall product roadmap and positioning. Define and execute our Content strategy. Produce and distribute relevant, high-quality marketing materials on various channels. Your editorial line will be multi-targets (prospects, clients, community, ecosystem, and partners) and will help both establishing our thought leadership and generating more leads. Contribute to the overall marketing plan – positioning, go-to-market, demand generation, product launch – in close relationship with the rest of the team. Market intelligence and content are your immediate goals. However, based on your profile and on the success of the mission, your function can extend to more strategic and managerial roles as the Company grows. Excellent people and project management skills to interact and organize teamwork across functional teams and third parties. You will leverage our existing and extensive base of active business users, and work in relationship with our partners to identify and qualify leads. You will identify, assess, and transform business opportunities using your skills in designing, negotiating, and closing deals (software license, SaaS). You will also contribute to the definition of our commercial offerings by working closely with both your clients and the rest of our team. Your creativity here will be as useful as your pure sales skills! While commercial wins based on our base of existing users are the immediate priority, the role can take, in the mid term, a more strategic and managerial dimension, according to your profile and to the success of the mission. You love to penetrate new markets, close deals and win the game! We are looking for developers & systems engineers to help our team improve Traefik. Please provide your contact information. We will message you back as soon as possible. Why are you the best candidate for the position? Try TraefikEE for 1 Month, for Free! Automatically receive your license key after filling in the form.